When looking around for great marketing strategies you can use to enhance the reach of your business, it’s easy to drown in a sea of suggestions. Everyone offers advice, and some of it’s good advice… and some of it’s not so good. What’s important is to find the right marketing techniques for you and your business. In my time in business, I’ve come across plenty of great ways to market products and target the right audiences. I’ve figured out, through trial and error, which ones work and which ones don’t. To my surprise, some of the best techniques I’ve discovered are the least used by business owners. 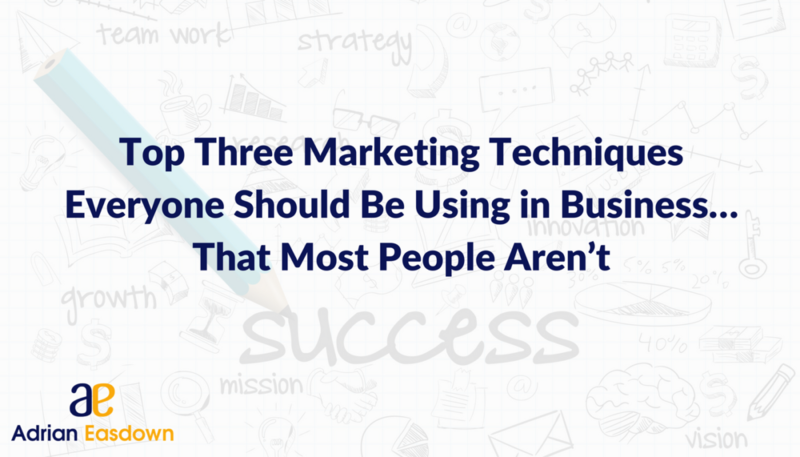 So, in this article I’m going to be sharing my top three marketing techniques that everyone in business should be using… but that most aren’t. It’s not much of a secret that you need to find out exactly who your ideal client is. You need to know everything about them: average age, gender, background, career, wants, fears, needs, etc. Everyone in business knows this, but few actually follow through with it, creating a detailed avatar of their target audience. But, worse than that, even fewer businesses follow up by drilling that ideal client and getting their message across to them. In our business, we know that our ideal client is female, usually with kids, is aged between 35 and 55, and is interested in camping, outdoors activities and surfing. Using this type of information, we’re able to really hone in on that avatar, often using social media as our channel. This result is more streamlined marketing, meaning you save on resources and have better results at the same time. Identify Your Assets and Push Them! When I first got into the accommodation business, people kept telling me that I needed to offer discounts and financial incentives to customers. I talked about why this isn’t necessarily a great idea in a previous article I wrote on increasing the value of your business. Instead of engaging in schemes that will risk hurting your revenue, you can simply identify what your key assets are and work from there. Think about what makes your business so appealing, why it stands out against your competitors, and use that as the centre-point to your marketing strategy. Once you have your ideal client in mind, and you know how to target them, you can start putting your valuable assets right under their nose, so that they know that your business has exactly the type of thing they want. There’s no sense in knowing your assets and targeting your ideal client without being aware of all the details in between. When we were assessing our business’ strengths and weaknesses, we decided that being a big tourist park was great, but that some people felt that large accommodation businesses were a little impersonal. So, we used it to our advantage. We began targeting big groups, and approaching them with tailored plans just for them. In short, we turned a weakness into a strength. This is the kind of thinking that you need to successfully tie together all your other marketing strategies to make sure that your resources are being used as efficiently as possible, and that you’re not leaving any stone unturned. Think about your ideal client, how to target them, your top assets and everything in-between to come up with a watertight way of maximising your business and making the most out of your already-great products and services!